What’s like a mixture between ice cream and whipped cream and a cloud? This Blueberry Protein Fluff. People. You NEED this Blueberry Fluff in your life! This recipe is INCREDIBLY VOLUMINOUS. Like, impossible to eat all in one sitting. It’s SO filling you won’t be able to finish it in all even if you tried… and oh, trust me, I tried ? And best of all? The recipe requires only 5 ingredients and the entire batch has just 240 calories, 2g fat, and 27g protein! I bookmarked a protein fluff recipe over 3 years ago and FINALLY got around to making it a little while back. 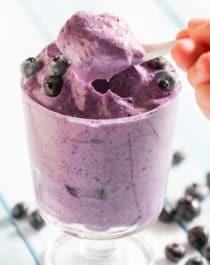 I made a few recipe changes: used natural, unflavored protein powder instead of the artificial ones, used blueberries instead of strawberries, used almond milk instead of water, and added stevia for sweetness. And daaaang am I glad I finally made it! It’s literally like ice cream and whipped cream and a cloud all jumbled into one. 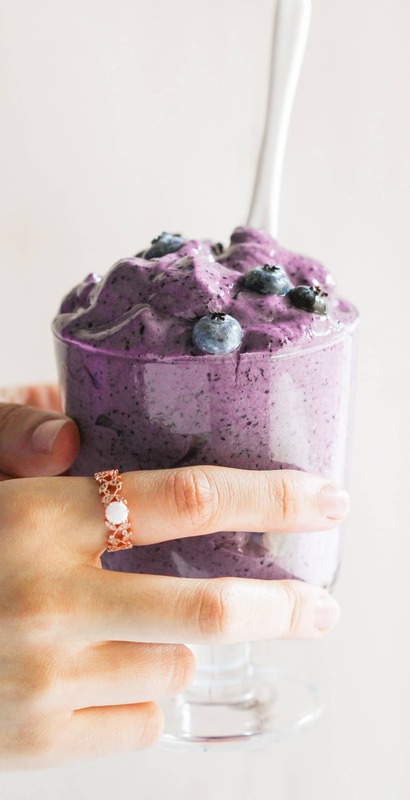 In a food processor, add the frozen blueberries, almond milk, and stevia extract. Puree until almost completely smooth. In a small bowl, whisk together the protein powder and xanthan gum. Dump this into the processor and blend again. After about 10 seconds, scrape down the sides of the processor to catch any powder that flung up, then blend again. Blend for ~1 full minute, or until the mixture doubles in volume and turns a nice blue/purple color. Serve immediately. Recipe adapted from my Blueberry “Whipped Cream”. My favorite part of this recipe is that it doesn’t deflate. Whipped cream will deflate. Ice cream will melt. And a cloud is not attainable, therefore, is not edible (sadly). 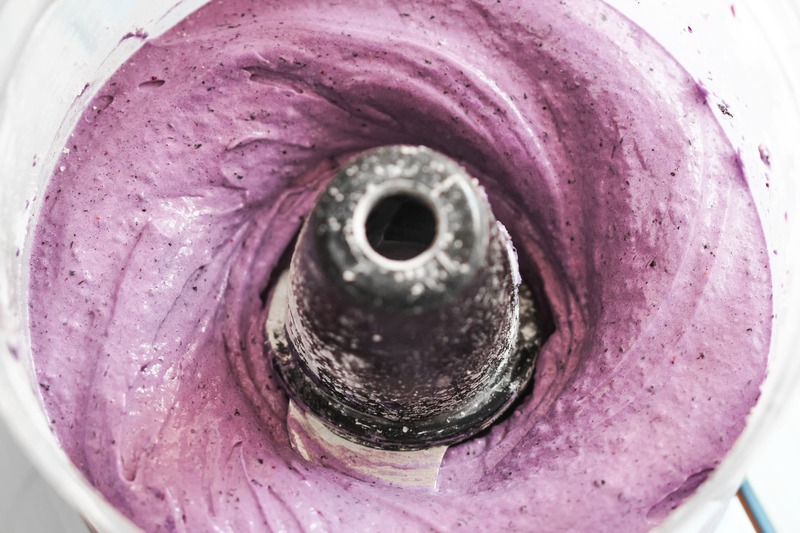 But this 5-ingredient Healthy Blueberry Protein Fluff? It’ll stay fluffy even if you refrigerate it for later! It’s super easy to make too. You just add all of the ingredients to your food processor, BLEND BLEND BLEND IT BABY, then boom. You’ve got one helluva beaut on your hands. Awwww yeahhhhh! Only 80 calories and .5g fat per serving, plus 9g of protein and 2g of filling fiber. I can (and probably will) eat this on a regular basis all year-long ?